The great thing about going to larger genealogy conferences is the chance to visit with the software folks directly. The FGS 2009 conference in Little Rock is no exception. 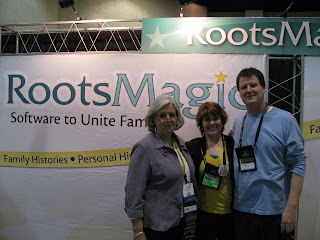 RootsMagic - genealogy management software. Personal Historian - for assistance with journal writing. Family Atlas - takes your ancestors' event locations and plots them on a map. Family Reunion Organizer - makes quick work of the "thrill" of getting the annual family get-together off the ground. Check out the details for the 2010 RootsMagic Valentine's Cruise. Wonder what my new groom will have to say about this?